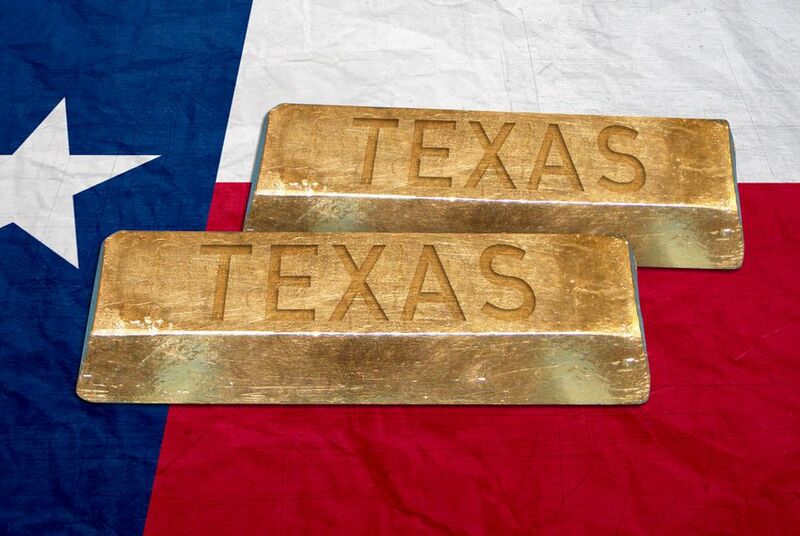 Texas just opened the nation's first state-run gold depository. Here's what that means. Texas lawmakers signed off on building the country's first state-backed gold depository in 2015 after the project was reworked to ensure a private firm would absorb all the costs. Gov. Greg Abbott said at the time that the project would allow Texas to “repatriate” gold from New York. A 23,000-square-foot building — operated by the private storage company Lone Star Tangible Assets — will serve as Texas' precious metals depository until 2019, when Lone Star is scheduled to open a facility double that size in Leander. Texas Comptroller Glenn Hegar became the first person to take advantage of the fully insured Texas Bullion Depository when he deposited his own gold and silver in the Austin vault earlier this week, according to his office. The construction of the Leander depository is set to begin “in the next couple of months,” said Kevin Lyons, spokesman for the Texas comptroller’s office. Once that facility opens, armored trucks will transport the precious metals from Austin to Leander. Any U.S. citizen hoping to use the Texas facility can set up an account online and either ship or personally deliver precious metals to the site in Austin. Customers will be charged for storage at an annual rate of 0.5 percent for deposits worth up to $2.5 million. Along with gold, the depository will accept deposits of silver, platinum, rhodium and palladium. The long road to the depository's opening began in 2013, when state Rep. Giovanni Capriglione, R-Southlake, proposed a bill to establish the state’s bullion depository, drawing the support of then-Gov. Rick Perry. But the bill floundered, largely due to estimates that it would cost the state $14 million in just the first two years. Two years later, Capriglione rewrote the bill to allow the state to hire an outside firm to manage the depository, with the expectation that the firm would charge fees to customers to cover the facility's costs. In its revised form, the bill sailed through the Legislature and landed on Gov. Greg Abbott’s desk with little debate. But despite that progress, Abbott's most ambitious aim for the depository seems unlikely to be fulfilled. The The University of Texas/Texas A&M Investment Management Company, which oversees the assets of the University of Texas and Texas A&M systems, holds $1 billion worth of gold bullion at the HSBC Bank in New York City, according to Karen Adler, a spokeswoman for the organization. When Abbott signed the gold depository bill into law in June 2015, he declared that the opening of a state-run facility would allow Texas to “repatriate” the nonprofit's gold supply. Three years later, however, the prospect of UTIMCO moving its gold to Texas appears remote. UTIMCO officials say the new Texas depository would have to become a member of the Chicago Mercantile Exchange’s COMEX platform, where gold futures contracts are traded, for any transfer to move forward. And Lone Star Tangible Assets Chairman Matt Ferris acknowledged on Tuesday that simple geography has prevented the Texas Bullion Depository from joining COMEX, whose rules stipulate that approved depositories must be located within 150 miles of New York. The state has also begun “very preliminary” talks with UTIMCO to discuss the possibility of moving the gold to Texas, according to Tom Smelker, the administrator of the state depository. And, on Wednesday, Hegar said the Texas comptroller's office will work to get the state depository approved by COMEX, even though it sits outside the platform’s radius. Disclosure: The University of Texas System and Texas A&M University have been financial supporters of The Texas Tribune, a nonprofit, nonpartisan news organization that is funded in part by donations from members, foundations and corporate sponsors. Financial supporters play no role in the Tribune's journalism. Find a complete list of them here.